Dent accumulated 39 sacks in college and was chosen by the Bears in the eighth round of the 1983 NFL draft. He had an undistinguished rookie season, starting three games at right defensive end and recording three sacks. Bears went 10-6 to finish first in the NFC Central while leading the NFL in sacks (a league-record 72), fewest yards allowed (3863), and fewest rushing yards allowed (1377). Won NFC Divisional playoff over Washington Redskins (23-19). Lost NFC Championship to San Francisco 49ers (23-0). Dent followed his breakout year with a 1985 season in which he led the NFL with 17 sacks. The Bears, fueled by their outstanding defense, went 15-1 and won the Super Bowl, a game in which Dent was named MVP, capping a postseason in which he recorded six sacks. An explosive pass rusher with great speed, he compensated for lack of size against the run with great agility and quickness. 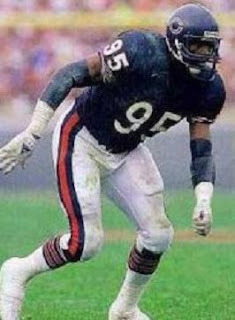 Dent went on to play a total of 12 seasons with the Bears and remained a potent pass rusher, even as injuries began to hinder his performance. He received second-team All-NFL honors from the Associated Press in 1988 and ’90 and first-team All-NFC recognition in those seasons from UPI and Pro Football Weekly, with Pro Football Weekly naming him again in 1993. Dent was also chosen to a total of four Pro Bowls. He moved on to the San Francisco 49ers as a free agent in 1994 but was limited to two games due to a knee injury. He returned to the Bears in ’95 and then played a year apiece for the Colts and Eagles before retiring after the 1997 season. Overall, he finished with 137.5 sacks, which ranked third in NFL history at the time, as well as eight interceptions and 13 fumble recoveries, one of which he returned for a TD. He added another 10.5 sacks in 12 postseason games. Dent was inducted into the Pro Football Hall of Fame, Class of 2011.